List of virtual server backups stored on the compute node. In order to use the compute node for backup purposes, the backup option needs to be enabled in the compute node capabilities settings. Name - Backup name (read-only). Hostname - Virtual server hostname as it was at the time of creation of the backup (used in the API) and the name of virtual data center the backup is associated with (read-only). Created - The date and time when the backup was created (read-only). Duration - The amount of time spent to create the backup (read-only). Size - The size of the backup (read-only). Datacenter - Name of the virtual data center the backup is associated with. Server - Virtual server hostname for which the backup was created. 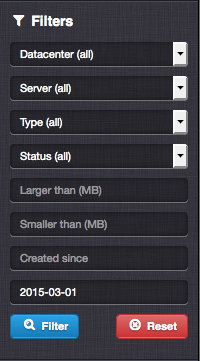 Larger than (MB) - Display backups larger than a specific size. Created since - Display backups created after a specific date. Created until - Display backups created before a specific date. It is possible to display backups of non-existing virtual servers by choosing the (no server) option in the Server filter. It is possible to perform the delete or restore operations only when backups for a particular virtual server are displayed. Please use the backup filters to display backups for a specific server. Delete backup - Remove data of the backup. Removal of a backup deletes only the backup data. Mass deletion is only possible for backups of a specific virtual server having the same disk ID. Restore backup - Restore server disk data from the backup to the existing virtual server disk or a disk of an another virtual server. A backup restore results in all data loss on the target virtual server and disk, including all virtual server’s snapshots.